Hello, great day to all of you .. with this being the jobs and organizations for this month to be very productive? I'm getting more and more organized to be more productive and also organize myself with the site to better assist you. To have more time to write and look for new patterns and tips to share with you. I love what I do because I know that many people can make beautiful patterns through this site and thus improve their skills in this wonderful and beautiful world that is the crochet. Wow, it's been super run this week that spent more will be for better each time. Although crochet has fallen out of fashion in an era, but the art never completely disappeared without getting lost with the news of new generations, still some people looked for works with crochet and with that was resurring the craftsmanship that making back to fashion. Today the crochet came back to be much practiced like before and even back the catwalks and you can find many pieces made of crochet that there are only crochet shops of people do this kind of work. He returned to the demand for materials and also increased the demand for ready-made pieces of clothing and decoration. There are separate baby items stores such as clothing, blankets and decorations for home decor and also things home stores such as rugs, table path, bathroom ornament, paper door, decorations etc. They were even invented more work that existed before and with that being able to leave their environment or their look still more beautiful and comfortable. In this matter that I brought to you is about a beautiful piece of babies and children that is delicate and leaves your daughter or relative even more beautiful and all moms love. Today's pattern is a gorgeous gorgeous crochet toddler dress with a butterfly detail made of crochet as well. I found this beautiful pattern browsing Pinterest behind children's dresses so that I could practice more and share with you. I love children's dresses made in crochet, and even better than buying in store is to have one done by your hands, make yourself the dress of your daughter, niece anyway. And so I really liked the style of this dress that I'm sharing today and bringing here for you to do this beautiful crochet work too. It is an intermediate level pattern that, with effort and dedication, even being level beginners, could make this pattern along with the chart that I will leave below for you. Having a girl is very beautiful, being a mother, aunt, godmother or even aunt and grandmother because we can dress and dress in a delicate way as if you could play doll again. You can combine the clothes with accessories and shoes leaving you even softer. The girls who wear crochet dresses are beautiful and delicate. If you like to make a crochet to gift or even a new piece to your store, abuse the Crocket models for its beauty. Working with wire is always a challenge and it takes time for the result to be rewarding, it's worth it. I did not find video to help more with the graphic is possible to do, being a great choice of dress for children. 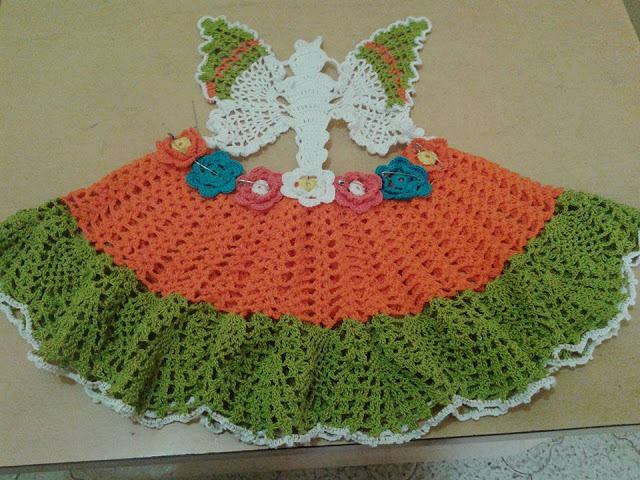 To make this child crochet dress I left in the photo it ready for you to see how it is just follow the chart below. We have other works with crochet dresses, at a glance on our site, we have many incredible patterns of all levels of crochet, with step by step and videos that will help you a lot and enjoy our page Xell Crafts and always see new patterns. To the next.